Yossi Sarid, a vocal atheist and former head of Meretz, raised quite a few eyebrows this week when he told an Army Radio interviewer (in the Hebrew interview below) that he once died and experienced his soul rising up to Heaven. Interviewer: Did anything ever happen to you that nobody believes really happened? 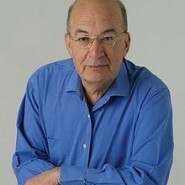 Yossi Sarid: Yes, so many things…But once, I died. Yes, I died. I already wasn’t in the world. And I was travelling with my whole family in our car, and I remember my children were miserable and sitting in the back, and crying for their father who had passed away. YS: No, this was a story that really took place. And nobody believes it happened to me. I: No, I do believe you. But I have to understand what happened, you were in the car? YS: …But I should clarify that I believe that this entire experience took place without Divine intervention from any Father in Heaven. I do not believe in the eternity of the spirit. That contradicts my ideology. I: But the classic atheist doesn’t believe that the soul and the body are separate. He believes that the body and spirit are one and when the body dies, the spirit dies with it. YS: And that’s what I believe as well.But what happened to me, it seems, does not correspond with my ideology. I am confused. How can that happen to someone, and yet he remains an atheist? it doesn’t make sense because it doesn’t make sense. He says that he holds an atheistic ideology, but his own experience contradicted his ideology. But he still holds it. And he isn’t even thankful that he didn’t actually die at that moment….. He wanted to be interviewed, to appear in the media, that all! Can I have an English translation of the interview? I am especially eager to know what Yossi experienced because I have been following his articles for some time now. Thank you Miriam from Montreal.